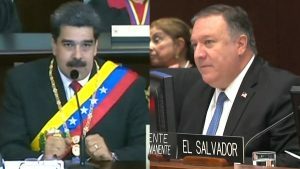 Secretary of State Pompeo has announced he is going to New York for a UN Security Council meeting Saturday regarding Venezuela. Boyle is professor of international law at the University of Illinois College of Law. He said today: “The U.S. government refusing to withdraw its officials from Venezuela may well set up a pretext for further intervention or blockade.” Boyle’s books include Foundations of World Order (Duke University Press). See IPA Twitter list on Venezuela for updates.